The Department of Homeland Security's Transportation Security Operations Center, in a photo from May 2011. 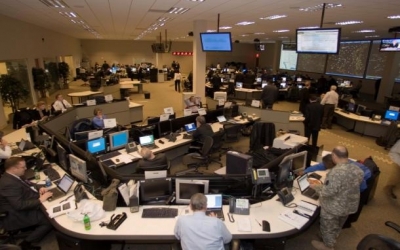 The US Department of Homeland Securitys ability to seek a shutdown of cellular and wireless networks in times of crisis, such as the potential of a remote detonation bomb threat isnt new. Exactly how and when that authority can be used, however, must be disclosed, thanks to a new ruling by a Washington, D.C.-based court. The US District Court for the District of Columbia has rejected Homeland Securitys argument that its reasoning and protocols for the so-called "kill switch" were exempt from public disclosure. The court ordered the release of the protocol in the next 30 days. Homeland Security can appeal the decision, but its not clear if the agency will. The Electronic Privacy Information Center (EPIC), which obtained a copy of the court ruling [PDF], is seeking details of Homeland Securitys so-called "Standard Operating Procedure 303." This protocol is described in the court filing as an "emergency wireless protocol...codifying a shutdown and restoration process for use by commercial and private wireless networks during national crises." Specifically, the protocol can be used in certain emergencies to, among other things, "deter the triggering of radio-activated improvised explosive devices." EPIC filed a request for the documents under Freedom of Information Act in July 2012. The federal agency released a heavily redacted and near-unreadable document, after first saying it could not find the records. Homeland Security said the disclosure would reveal "techniques and procedures for law enforcement investigations or prosecutions." The privacy group took legal action in order to reveal the full text of the protocol. This story originally appeared at ZDNet under the headline " Homeland Security must disclose cell network kill switch protocols, court says."